The XTENDEX?ST-C5KVM KVM Extender allows one PS/2 keyboard, PS/2 mouse and VGA monitor to be placed up to 1,000 feet from a computer using CAT5/5e/6 UTP cable. 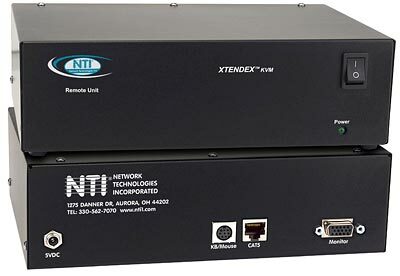 The extender consists of a local unit that connects to a computer or server and also supplies video to a local monitor, and a remote unit that connects to a monitor, keyboard and mouse. The units are interconnected by CAT5 cable. The ST-C5KVM is not designed to be connected to an Ethernet card, Ethernet router, hub or switch or other Ethernet RJ45 connector of an Ethernet device. Damage to devices connected to the Ethernet may result. Use the PWR-48V-5V2A DC-DC power converter to install the remote unit in a Telecom environment.